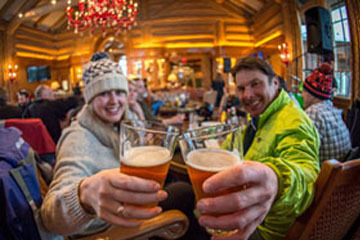 Snowbasin Resort releases the rest of the ski season’s après scene events. After a day on the slopes, Snowbasin Resort has a little bit of everything for someone looking to après. From football fanatics to music lovers to foodies, the Cinnabar has plenty to offer. Want to spend the day on the slopes, but need to catch that playoff football game? Snowbasin Resort is offering big screen viewings of all the playoff games every Sunday in the Huntington Room leading up to the Super Bowl. Access the full bar and food menu of the Cinnabar while cheering on your favorite team on a big screen. In addition, let Snowbasin Resort do the cooking for game day on Sunday, February 5th, and head straight from the slopes to the big screen with Snowbasin Resort’s Annual Super Bowl Party. With an all-you-can-eat appetizer buffet, full bar, giveaways from Uinta Brewing and Budweiser, two 55’’ screens in the Cinnabar and the Mack-daddy 6’x8’ HD projector in the VIP Room; Snowbasin Resort is the perfect place for your Super Bowl Party. Call 801-620-1021 to make a reservation for your football fun. Check out the menu online at http://www.snowbasin.com/events. Free après music continues through the rest of the ski season from 3:30pm – 6:00pm on the weekends and holidays. The Cinnabar is a great place to catch up with friends while listening to a variety of genres. This weekend alone there are Nate Robinson Trio and Andy Frasco. For the full music line-up, visit http://www.snowbasin.com. For the foodie, save the dates of the Cinnabar’s three Après Ski culinary expeditions. On Tuesday, January 31st from 11:30am – 6:00pm the après ski culinary expedition has the theme of ‘Mongolian Hot Pots.’ Explore your cravings of Traditional Hot Pots, where a simmering pot of broth is placed in the center of the table for sharing and many ingredients are then cooked by those sharing the pot in the hot broth. On Tuesday, February 28th from 11:30am – 6:00pm the après ski culinary expedition has the theme of ‘the Joys of Beer and Chicken Wings.’ There will be special beer pairings from Wasatch Squatters Brewery and the chefs will be making a variety of wings for tastings in orders of three. The last après ski culinary expedition is on Tuesday, March 7th from 11:30am – 6:00pm with a Fondue theme. There will be Traditional Swiss Fondue, Broth Fondue and Chocolate Fondue to choose from.